Just finished Wasteland Rebel​’s book ‘Zero Waste : Simple Life Hacks to Drastically Reduce Your Trash’ and it’s reinspired us to continue our journey to zero waste. Gotta be honest, a lot of the suggestions in the book are advanced so we decided to focus on reducing our single use consumption for now. Here is an example of our zero waste kit. Wasteland Rebel recommends planning what you’ll need before you leave the house or you could keep the kit in your car. 1. Snapware glass containers. We bought these at Costco and they are perfect to when eating out to store your leftovers or to bring snacks/lunch to work. 2. Metal straws – 500 million straws are used EVERY DAY and most of them end up in the ocean harming marine life. These straws we bought on Amazon come with a bent and straight option. 3. Foldable shopping bag – This bag attaches to your keys so you never leave home without it. And don’t forget to use it when shopping for smaller items like clothes, toiletries, etc. 4. 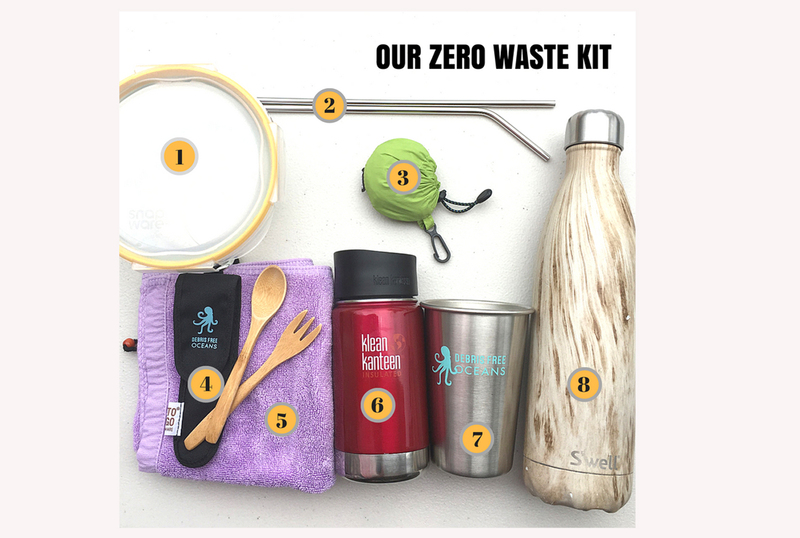 Reusable bamboo utensils – Debris Free Oceans​ has a starter kit with these utensils, a foldable shopping bag and reusable bottle. These utensils come in a convenient pouch so you can say ‘no thanks’ to plastic when eating out. 6. Insulated cup – This Klean Kanteen​ tumbler is perfect for bringing coffee on the go or buying coffee. It keeps warm for hours. 7. Aluminum cup – These cups are ideal for avoiding those plastic red cups at a party AND you’ll always know which is your cup. 8. Reusable bottle – We rarely leave home without our S’well Bottle​. They have great designs and keep drinks cold/hot for hours. We hope this inspires you to create your own kit. Let us know if you already have one in the comments section below!